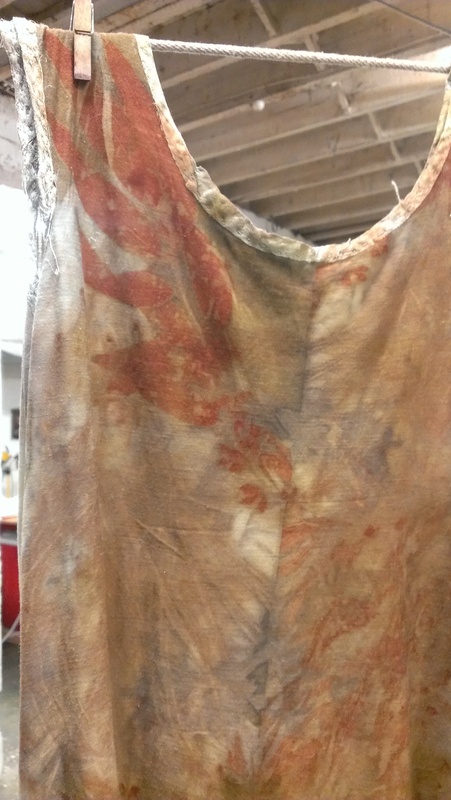 Second Skin offered lots of possibilities for learning-by-looking through the admiration of plant-dyed clothing. India Flint was wearing her own creations every day and it was a delight to have that opportunity to see them in use and to think about their construction/reconstruction/dyeing. Other participants wore clothing they had dyed sometimes too–also a pleasure to admire. And India brought along some garments to show. She gave permission for me to show images of this dress. The upper part (bodice?) is a knit fabric–I am assuming it’s silky merino. 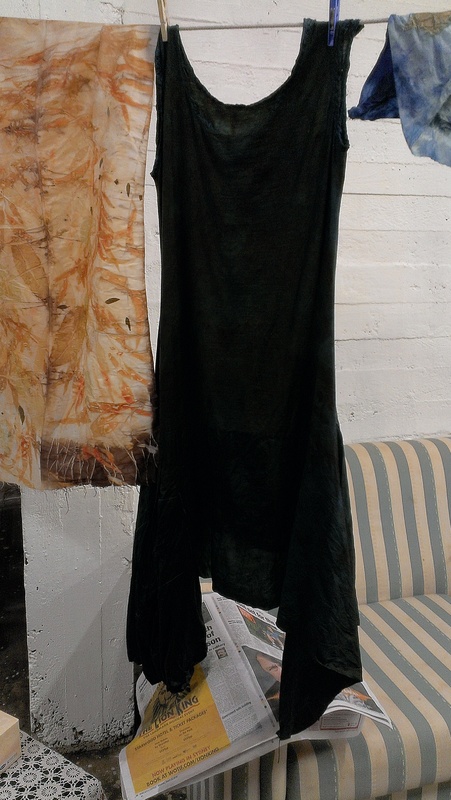 The neckline and armscyes have been bound with a different fabric: a sheeny silk that has taken up dye differently. There’s a lovely leafy detail heading toward one shoulder. The skirt of the dress is asymmetrical, and composed of a variety of fabrics, some repurposed. There is a large pocket in the skirt that might once have been the neckline and part of the front of a shirt, replete with buttons. I found that a delectable detail. This view shows how lush the skirt is. I loved the generous, undulating hemline and skirt. India gave a demonstration of how it had been created. I loved the idea of using a variety of fabrics and textures in a single garment. I’m a plain sewer, as you may have detected, and my mind was abuzz with ideas for using some of the lovely pieces of fabric in my stash of eco-printed fabrics in this way. Hand-stitching clearly has advantages in creating this kind of garment and coaxing all its component parts into a sweet relationship with one another. I found it really interesting to observe this use of eco-printing as a way of creating a series of colour and texture effects, rather than the way I tend to use it, in which I am aiming for images of leaves as a predominating motif. 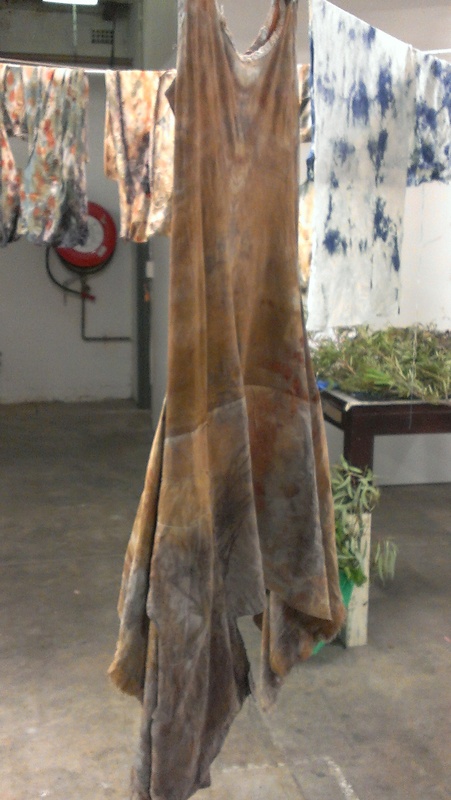 Here is the same dress again, drying after a dip in indigo! As is obvious, relinquishing control isn’t one of my strong points! I love the capacity to create a leaf print that eco-printing provides: but that’s only one of the possibilities, clearly. 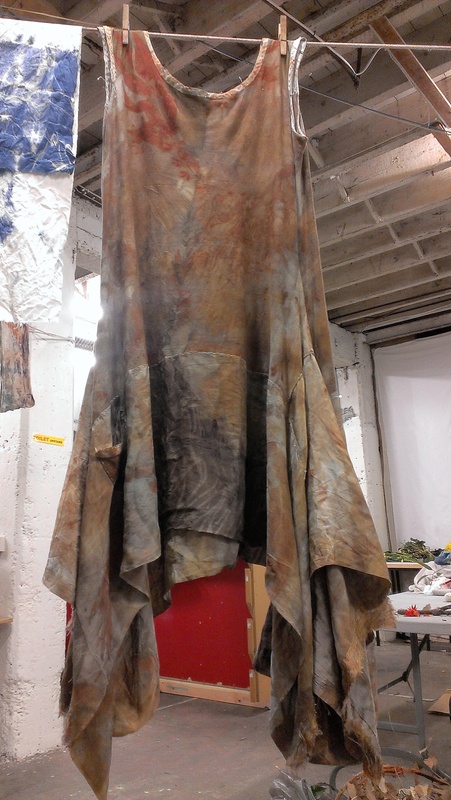 I find the way you compose a garment using a variety of textures, colours, fabrics and patterns really fascinating. But I’ve spent my whole sewing life making pretty plain garments and my whole life wearing pretty plain garments and it’s a wardrobe breakout for me to wear a bold print fabric. It’s entirely possible I might go on with that orientation in my own wardrobe (and continue to love leaf shapes in eco printing the way I love them in regular printed fabrics). And also continue to be an admirer of striking garment and fabric design like yours. I feel about this a bit the way I do about going to an art gallery. The fact that I couldn’t live with a painting on the wall of my bedroom doesn’t mean I like, enjoy or appreciate it any less. I don’t go to an art gallery with the expectation that I could bring anything home, that’s all! India’s dresses are so beautiful. It was nice to read your description and use of different fabrics in one garment. Makes me think about preparing several different fabrics in the same dyebath or using some of the same dye materials so that they will all go nicely together if combined in the same garment. I also admired how dark blue the indigo dress is. I only use my fresh indigo leaves from plants I grow myself and it takes LOTS of leaves to achieve even a medium blue. My seedlings for this year’s garden are a couple of inches tall,now and will be ready to plant outdoors in a few weeks. I may relent one of these days and purchase some powder. Thanks for sharing! I’m growing indigo too. My plants are about ready for harvest and I’m stoking my courage. I agree, you need a lot to male a colour that deep–and overdyeing no doubt assists that effect. Your plans for new garments sound very exciting!